Hiya guys! Happy New Year everyone! Of course we have to kick off the new year with the mega-hit Polish Pickup. It's one of the most fun collaboration ideas that has ever taken fruit in the indie community. I definitely cannot wait to see the themes and surprises this monthly occurrence brings us. Now for today I'm sharing swatches for Sassy Pants Polish January contribution to the Polish Pickup Collaboration. And ladies, it's all about the bling bling as we indulge in crystals and gemstones. Goodbye no spend it was nice while it lasted... aka one day, haha. Now let's get to the swatches! 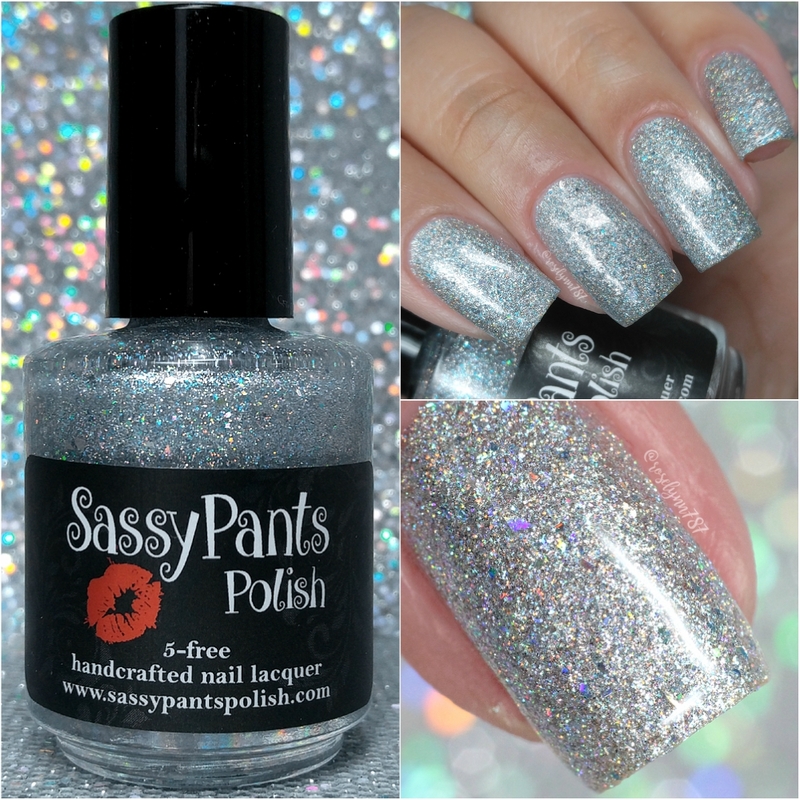 Diamonds are Forever by Sassy Pants Polish will be available for purchase through the Polish Pickup Shop Friday, January 5th at 11AM EST through January 8th. This full-size 15mL shade will retail for $12 each. If you're not familiar with the concept, the Polish Pickup offers a fun, interactive experience that allows you to submit theme ideas, vote for your favorite theme, and selectively purchase your favorite polishes every month. As I mentioned before, the theme that was voted for January is Crystals & Gemstones. This month Angie found inspiration from girls best friend... Diamonds! Diamonds are Forever can be described as a silver scattered holographic polish with micro-glitters, flakies and shreds. Also features a slight blue/green/purple shifting shimmer. Let me just say... photos don't do the sparkle any justice. It's absolutely stunning in direct sunlight. The formula has a sheer application that builds-up for full coverage or can be worn as a topper. The consistency is well balanced, not too thick or too thin. I was definitely very pleasantly surprised by the ease of the formula. There is no need to dab for full coverage, it's really easy to layer and work with. It dries down to a textured finish that smooths out with a thick layer of topcoat. Shown in three coats and sealed with a glossy topcoat. To recap, Diamonds are Forever by Sassy Pants Polish will be available for purchase through the Polish Pickup Shop Friday, January 5th at 11AM EST through January 8th. This full-size 15mL shade will retail for $12 each.